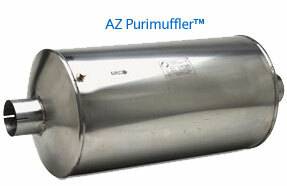 * AZ Purifiers and Purimufflers offer an industry leading, verified 20-40% PM (Particulate Matter) reduction* values depending upon on the application. Other manufactures offer only verified PM reduction* values of 20 to 26%. Our competitors claim to offer similar high levels of PM reduction, but only Engine Control Systems backs it up with actual EPA verification. * THE BEST DOC SOLUTION IN THE INDUSTRY, PERIOD! AZ Purifiers and Purimufflers employ an advanced zeolite containing washcoat and precious metal catalyst that afford superior low temperature performance. * With over 800 direct fit designs, ECS provides you with the most cost effective long term solution which you can feel good about. * Why would you buy less PM reduction from another manufacture? ECS AZ Purifiers and Purimufflers™ allow you to reduce more PM from more vehicles. ECS also offers the DZ and EZ diesel oxidation catalyst supported on a metallic substrate which affords exceptional resistance to vibration and affords the lowest possible exhaust backpressure. * The DZ series was the first diesel purifier in the industry to feature quick release band clamps. This allows the center body to be readily removed for periodic engine-out opacity measurements or for purifier cleaning. 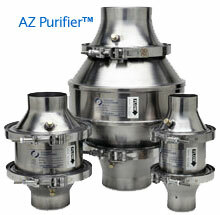 These DZ purifiers are also available with modular add-on DMS and DMXS silencers.